Summary: A $300 bench scope really shines. Once upon a time purchasing an oscilloscope was a major decision as the price for a decent unit was astronomical. Even today the best units will set you back the price of a new Toyota, or more. Some high end units approach a half-million dollars. Then a series of inexpensive USB-based units appeared. These are all quite small boxes that use your PC's display and virtual controls rather than a panel full of knobs. Some of these are astonishingly cheap; others offer very high performance for an attractive price. In recent years several Asian manufacturers have been producing bench scopes - units that look very much like that Keysight or Tektronix unit you've always wanted. A full panel includes the controls and a color display. 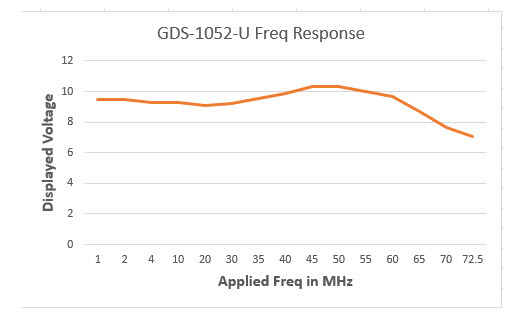 I reviewed a $400 100 MHz Siglent (http://www.ganssle.com/reviews/review-of-siglent-sds1102-scope.html) last year. GW Instek has a range of test equipment, and I recently bought a GDS-1052-U to evaluate. The $300 (I got it on sale for $259) price made me suspect it was cheap crap. So many of these Asian scopes look so similar I figured they were all made from the same design. That is apparently not the case. Bootup took 14 seconds, twice as long as the Siglent, and features and menus differ considerably even though their physical appearance is similar. The 1052 is a dual channel 50 MHz unit with a 5.7" TFT 234 by 320 pixel display. The screen resolution is nothing to brag about, but I found it entirely adequate. I have gotten used to the bigger screens common on high-end scopes today, so find this one a bit small. However, it's about the size we used in the 60s, 70s, 80s and into the 90s. Some off the displayed data, like the notations above and below the trace area, I found a bit hard to see, though my myopia and cataracts are probably more at fault than the instrument. Characters are not completely crisp, but are clear enough. Note the menu to the right of the screen. That cannot be turned off, so always eats up some display area. Triggers modes include video, edge and pulse. The latter lets you trigger on a signal that's greater than, less than, equal to, or not equal to a value between 20 ns and, well, I got tired of spinning the knob at 1 second. It's slow going, though; that much adjustment requires a lot of knob cranking. I considered using a drill to spin the control. Cursors are hugely important and a pet peeve. On so many scopes they are a pain to manipulate. The 1052's are extremely easy to use. 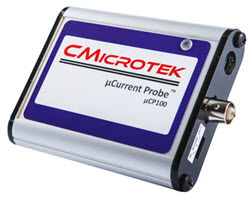 All scopes have a probe compensation capability, which is generally a 1 KHz square wave output. The 1052's can be adjusted from 1 KHz to 100 KHz, with a duty cycle variable from 5 to 95%. So you also get a primitive pulse generator. The supplied X1/X10 probes are adequate but will not win any awards for robustness. Out of the box the horizontal accuracy was too good to measure, and the vertical was off about 4% on DC signals. But there's a self-calibrate mode using an output on the rear panel. I couldn't get it to work using a probe, but with a cable with BNCs at each end the problems went away, and the resulting DC vertical accuracy was spot-on. Three acquisition modes exist: normal, average (from 2 to 256 samples in power of two sequence) and peak. The manual claims peak shows the biggest and lowest values encountered, but I couldn't get that to work. It seemed just like normal mode. Horizontal is about the same as any other scope with one glaring exception. At sweep rates of 50 ms/div or slower the system enters roll mode. The only trigger option is auto. So it's basically impossible to measure slow signals. That could be a deal-breaker for some, though this will only effect signals that are a handful of Hertz. I could display an entire cycle of a 4.5 Hz square wave on the 25 ms sweep setting, which, of course, supports normal-mode triggering. I also didn't like the vertical position knobs. Turning them made the waveforms jump around a lot. It's not a real problem, but was annoying. The waveform bounces back and forth on the horizontal axis when displaying a sine wave. I see this in most of these cheap scopes. The problem goes away when displaying a square wave, so I attribute this to some triggering uncertainty. Notice the right side shows the Screen Save menu. I'd prefer it displayed the menu that was on the screen before pressing Save, as that is where measurements are shown. And plenty of auto measurements (Vpp, Vmax, Risetime, etc.) are included, probably more than a typical user of this instrument would ever need. A math trace will show the sum or difference of the two channels, or the FFT of one. I couldn't figure out how to slide the FFT in the frequency domain, and the horizontal frequency-domain axis is unlabeled, so that feature is pretty much useless. The manual, which is surprisingly good, and is even written in decent English, barely touches on FFTs. A couple of other features might be really useful. It will log data to a USB stick at intervals from 5 minutes to 100 hours. The file names will increment, a good feature, since there's no way to enter date or time. All files have a 12/31/2003 11:00 PM creation date. And there's a Go/No go feature which tags waveforms that go out of bounds you set. The following chart shows my measured frequency response of the instrument. A ten volt sine wave was applied and the displayed amplitude plotted. Considering it's rated at 50 MHz, this is pretty good. In fact, my unit got to the -3 dB point at 72.5 MHz. These measurements were taken using the supplied probes so reflect total system bandwidth. This is not a scope for a professional lab. But a hobbyist or firmware engineer not needing a ton of performance could get good service from it. If you can live with the 50 MHz rated bandwidth and nits mentioned here, I recommend it. I really have no use for the unit, having a number of other scopes here, so will give it away. More info here: http://www.ganssle.com/contest.html .